Mario Vargas Llosa's classic early novel takes place in a Peruvian town, situated between desert and jungle, which is torn by boredom and lust. Don Anselmo, a stranger in a black coat, builds a brothel on the outskirts of the town while he charms its innocent people, setting in motion a chain reaction with extraordinary consequences. 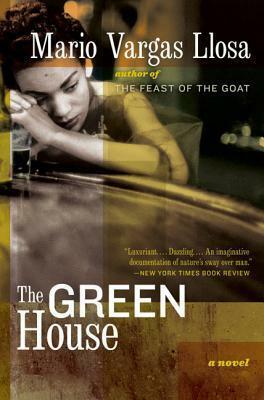 This brothel, called the Green House, brings together the innocent and the corrupt: Bonificia, a young Indian girl saved by the nuns only to become a prostitute; Father Garcia, struggling for the church; and four best friends drawn to both excitement and escape. The conflicting forces that haunt the Green House evoke a world balanced between savagery and civilization -- and one that is cursed by not being able to discern between the two. Mario Vargas Llosa, uno de los más destacados novelistas contemporáneos latinoamericanos, se lanzó a la fama con su novela La ciudad y los perros que obtuvo el Premio Biblioteca Breve y el Premio de la Crítica. Novelas posteriores son, entre otras, La casa verde (Premio de la Crítica y Premio Internacional de Literatura Rómulo Gallegos), Conversación en La Catedral, La guerra del fin del mundo y Lituma en los Andes con la que obtuvo el Premio Planeta 1993. Ha publicado también obras teatrales, ensayos y memorias. En 1986 compartió con Rafael Lapesa el Premio Príncipe de Asturias de las Letras y en 1994 se le concedió el Premio Miguel de Cervantes de Literatura.